Två trick + gimmick på samma DVD! Helt ny i oöppnad förpackning. SWEET: The magician borrows a ring or coin and has it initialed. 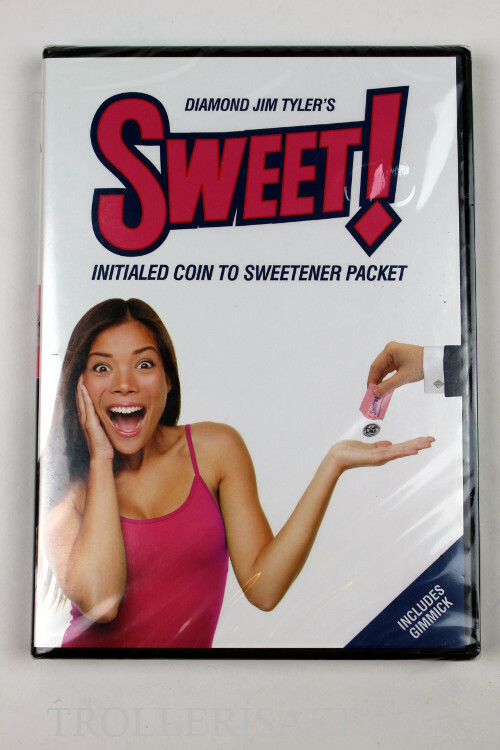 In a flash the borrowed object vanishes and reappears inside of a sealed sweetener packet that has been in full view the entire time. ! As a bonus you will receive another reputation maker called THE BIRTHDAY CARD. The birthday person selects a card from a blue backed deck and signs it. The magician has trouble finding it, so to divert their attention he presents them with a sealed greeting card envelope. He claims that inside is a birthday card BUT Instead they find a red backed playing card with a personal birthday message printed on the back! When the card is turned over, to their surprise it is their signed card! Diamond Jim has used both of these reputation makers for over 15 years to slay spectators! The DVD was shot before a live audience andincludes the necessary gimmicks.